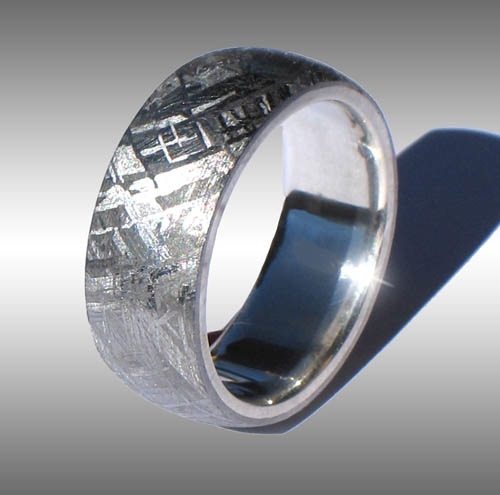 Our custom meteorite rings are quite durable. That being said, if you would like your ring to stay looking nice you should care for your ring as you would any other fine jewelry. Some common sense will go a long way. Don't wear your jewelry while doing yard work, construction work, automotive work, or similar activities or while handling abrasive or corrosive materials. Don't abuse your jewelry, or hit it against hard objects that could dent or scratch it. The Gibeon and Seymchan meteorites tend to be naturally rust-resistant, so while hand washing and showering are, in our experience, not a problem, we do not recommend exposing your meteorite jewelry to excessive moisture. As with any fine jewelry, our rings should not be exposed to chlorine, bleach, chlorides, house hold cleansers or acids (nor should your hands). Don't wear your jewelry in salt water, the hot tub or swimming pool. Some hand lotions can cause staining of your finger so we avoid wearing hand lotions with meteorite rings. In cold weather or if you go swimming, your finger can shrink substantially causing your ring to fall off, so don't go swimming with your jewelry. After a number of years, the etch pattern of your meteorite ring may be less sharp. If this occurs, the ring can be re-etched. Meteorite rings contain 7-9% nickel, so if you are allergic to nickel, meteorite rings may not be the best choice for you. WARNING: Like several other types of jewelry, meteorite rings contain iron, which is naturally attracted to magnets. To prevent your ring from being pulled or yanked do not wear your jewelry near strong magnetic fields such as MRI machines, powerful electro-magnets, rare-earth magnets etc.